Nick Sandmann, the student from a predominately white, private high school in Covington, Kentucky who was videotaped smirking at a Native American elder and Vietnam veteran at the Lincoln Memorial over the weekend, was afforded an opportunity to explain what happened from his point of view during MLK weekend in Washington D.C. on a national platform. 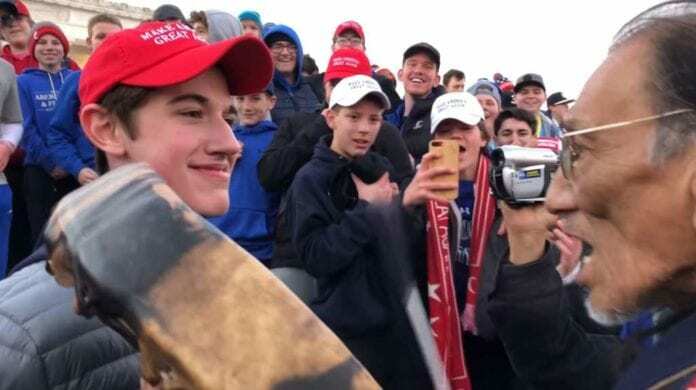 Nathan Phillips, 64, the Native American man who Sandmann smirked at, claims he heard the white teenagers say “build the wall,” but the 16-year-old denies this. In addition, back in 2011, the 90 percent white school showed Covington students wearing blackface at a basketball game.